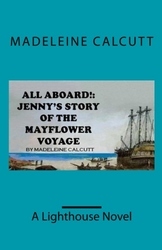 This week Strands of Thought is excited to host Jenny from All Aboard: Jenny’s Story of the Mayflower Voyage. It’s so great to have you with us, Jenny. Tell us a little about yourself. My name is Jenny and I first lived in England. We had to get out of England because things were bad there for us because we worshipped in a different way and people didn’t like it. We had to escape and we went to Holland and left there in 1620 setting off for a land over the waters, which Pa called ‘our promised land’. We would be able to worship in peace there. It was exciting to go all that way by ship, but it was frightening too. There were not many white people where we were going but there were natives who belonged to this country called Indians. Sometimes they killed people, but we had heard of some friendly ones. I didn’t know whether I wanted to meet one or not. I did, and the ones we met were very good to us. My, my, Jenny. That is a lot of change for a girl your age. And to meet Indians, too. Good thing you already understood that being different doesn’t make you bad, huh? You know, because of the way you worship. What are some of the challenges you face in your new home? The conflict that I have been trying to cope with is accepting the way things are. They are not the way I would like them to be. Our way of life is tough. We came here with almost nothing and we had to build our own houses and plant our own vegetables. I used to get such a sore back when I first started looking after my part of the garden. I think the worst thing has been when everyone on the ship started getting really sick and they died. My little baby sister died of this awful disease that was going around. We had to bury her at sea. It is hard to try and forget the pain you feel. Once I had a baby sister and now I don’t. I’m sorry you lost your sister, Jenny. It sounds like your new lifestyle is quite different from what you were used to. Just when you think things are getting better, we get a storm and all our vegetables are ruined and we have nothing to eat, or our corn won’t grow. It seems we are nearly getting there and are able to provide for ourselves and then . . . oh no, our crops fail and we have to start again. And when we were on the ship coming over, we’d think all the leaks had been fixed up and then there would be another leak in the ceiling right over our bed. The damp made people cough and they became very ill. Things like that. That I can do it. I mean that I can put up with the hardship. That when someone else dies during the awful winter we have just had, I don’t go to pieces. I think we are all learning to be brave and Pa says we must look to our Maker for our strength and I think I am learning to do that and this helps me cope when times are hard. Also, friends are important. It is hard to get through all this by yourself. You need a friend. I’m glad to hear you’ve made new friends. Tell us about them. Isobel, her name is. She is my best friend. There are other girls we play with like Mercy and Rebecca, but Isobel and I talk together. I mean, really talk, and we can have a lot of fun together. She likes climbing trees too, even though we are not allowed too. Jenny, what would you say is your strongest personality trait? I think it is that I accept people, not for what color their skin is, but for what they are like inside. We have made friends with the Indians, the natives in our new country, America, and I know there are lots of different things about them but underneath they feel the same as we do. And finally, Jenny, if you could change one thing in this world, what would you change? I would let everyone be themselves. I would let people worship their god however they wanted to and I would make sure that no one would go without food and I would encourage people to love everyone for what they were like inside. Oh, did you say ‘one thing’? Sorry. That’s quite all right. Those are all good things to want to change. Good luck in you new home, Jenny and thank you for visiting with us. The author, Madeleine Calcutt, has always loved writing, even in her childhood, having written scripts for theatre companies when she was in her teens. Her teaching background led to a career as a children’s librarian in schools and public libraries. This writing passion was further fired up after completing several writing courses. Her experience with these, culminated in her teaching creative writing in local community centers. Several writing groups that Madeleine coordinated evolved from the writing classes. She also worked as a tutor for a correspondence writing college. Madeleine has written children’s picture books, plays, children’s short stories, stories for women, and has had her Mayflower novel and an adult novel called ‘Step of Faith’ published. She is writing a series of historical fiction novels for older children and young adults and has recently completed the second novel in the series. This novel, based on early Australian history, is about convicts and is called, ‘Transportation! : Linney’s Convict Years’. Her next one deals with the blitz in England in WW2. This sounds like an exciting story for kids & adults alike. Thanks, Kai, for the interview. Madeleine, I'll put it on my to-read list. Thanks for wonderful sharing. I feel I know you better. I'm so glad you stopped by, Janet. I agree that this sounds like an exciting way for kids to learn about this segment of our history.